Macroeconomic concerns fading: The risk on/risk off approach of these markets, characterized by rapid in-and-out moves by hedge funds and aggressive money managers, seems to be abating. Individual company fundamentals return to vogue: US corporate earnings continue to represent a growing part of the US economy, as they have since 2009. Correlations decline: One notable feature of a risk on/risk off market is that correlations among markets, among sectors, among countries and between stocks are very high. In 2012 and already in 2013, we have seen those correlations fall significantly. Playing catch-up: In 2012, the market kept rising on low volume despite the market skepticism that was predominant throughout the year. There was cash everywhere as conservative positioning took over. And everyone was waiting for a dip, which hardly ever came. Now these huge cash hoards appear to be coming back into the market. Asset allocation shift: In 2012, pension funds and major tactical asset allocators were overweight bonds and cash. Now those allocations seem to be moving more toward equities as the models seem to indicate better total return characteristics in "risk assets" than in other more conservative assets. Volatility falls: Violent lurching is often characteristic of downward markets. In 2012, however, markets moved higher and volatility receded significantly. Confidence rises: Market exuberance, in addition to earnings and fundamentals, also moves markets. Now that some of the uncertainty surrounding the fiscal cliff and the eurozone has lifted, individual and corporate investors are feeling better and confidence readings have risen. Economic fundamentals supportive of profit gains: The US economy has been growing for almost four years. We are finally seeing some of its weaker parts pick up steam. Investors today seem more positive and more driven by individual company and sector performance. Please use the links below to read the full article in different languages. relied upon as a recommendation to purchase any security or as a solicitation or investment advice from the Advisor. 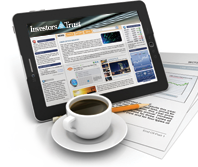 ‡Investors Trust Administration, LLC does not offer investment advice or make recommendations regarding investments. You should consult your own tax, legal or investment professional to assist in your financial decisions. Investors Trust Administration solely provides administrative and clerical support to Investors Trust Assurance, SPC and its Investors Trust products.